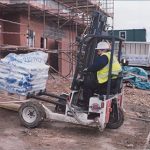 Since MSE-FORKS first launched its hydraulic forks onto the logistics market, it has not only been supplying standard hydraulic lift truck forks, but also custom-made solutions on behalf of forklift truck manufacturers and dealers. A sector with special requirements is the food industry that is required to operate according to very strict rules including HACCP, International Food Standard (IFS) and British Retail Consortium (BRC) standards. These standards are particularly stringent with regard to hygiene. Hydraulically extendable forks often have to be adapted to avoid wood or plastic splinters. Extendable forks – as their name suggests – can be extended hydraulically to accommodate certain pallet dimensions, e.g. 800 x 1200 mm. This minimizes damage to pallets, as forks do not hit anything positioned behind the pallet being handled. Rust formation on truck forks is another issue that needs to be addressed in order to prevent rust and paint getting into food products. HACCP standards do not actually require the use of stainless steel truck forks, but many leading companies would rather err on the side of caution. Hence, MSE-FORKS provides its food industry customers with several suitable solutions. If customers use telescopic forks for double stacking pallets and/or one-sided truck loading and unloading, then stainless steel outer forks are adequate. If telescopic forks are used as hydraulically extendable forks, then another option includes stainless steel outer forks and stainless steel coated inner forks. At companies where forklift trucks are subjected to extreme conditions, e.g. where salt and grit are used, telescopic forks are made of solid stainless steel. This presents MSE-FORKS’s engineers with a big challenge, as stainless steel is extremely difficult to form and weld. 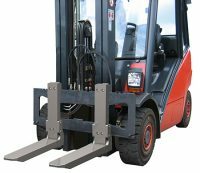 Solid formed stainless steel lift truck forks are virtually, if not totally, non-existent due to their low tensile strength. Hydraulic forks MSE-FORKS therefore opted for a hydraulic fork design consisting of vertical and horizontal elements. These two parts are connected by means of a pin and pinhole to achieve sound structural integrity. Telescopic fork mounting blocks are attached to the vertical fork mounts using stainless steel bolts. This system was selected in preference to welding, as stainless steel welds always form the weakest link in the chain and act as source of weld decay or knifeline attack. The special-purpose MSE-FORKS structure forms a strong and reliable rust-free product for hygienic operations.